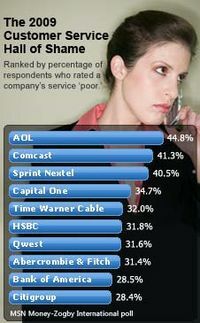 No less than three alert readers forwarded me MSN Money's 2009 Hall of Shame. So, I'd better pass it along! Nine of the ten "winners" are repeat offenders. Some might argue that turning things around for some of these corporations is like making a u-turn in an aircraft carrier. Nevertheless, many companies and industries have taken the recession as an opportunity to improve customer service and win market share, and clear improvements have been noted by consumers in certain sectors. In seems, therefore, that annual designation on the Hall of Shame points to a lack of true commitment from the executive and management teams of these companies to make the changes necessary. The Hall of Shame is a great reminder of the oft forgotten edge on the double edged Customer Service sword. What Customer Service Reps (CSRs) say and how they say it is only part of solution. Positive change in customer service requires an executive management team that is committed to correcting the failed policies and procedures that CSRs are forced to manage and support on the front lines.